A biochemist shows how we can finally control our fat—by understanding how it works. Fat is not just excess weight, but actually a dynamic, smart, and self-sustaining organ that influences everything from aging and immunity to mood and fertility. 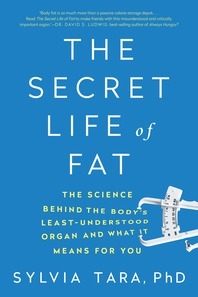 With cutting-edge research and riveting case studies—including the story of a girl who had no fat, and that of a young woman who couldn’t stop eating—Dr. Sylvia Tara reveals the surprising science behind our most misunderstood body part and its incredible ability to defend itself. Exploring the unexpected ways viruses, hormones, sleep, and genetics impact fat, Tara uncovers the true secret to losing weight: working with your fat, not against it. “Body fat is so much more than a passive calorie storage depot, as Sylvia Tara brilliantly shows. Read The Secret Life of Fat to make friends with this misunderstood and critically important organ.” — David S. Ludwig, MD, PhD, Professor, Harvard Medical School and author of the #1 New York Times bestseller Always Hungry?